Bodnar is the happy face of atheism at Iowa State University. Once a week at this booth at a campus community center, the doctoral student who spends most of her time researching the nutritional traits of corn takes questions and occasional abuse while trying to raise the profile of religious skepticism. Campus affiliates of the Secular Student Alliance have multiplied from 80 in 2007 to 100 in 2008 and 174 this fall, providing the atheist movement new training grounds for future leaders. In another sign of growing acceptance, at least three universities, including Harvard, now have humanist chaplains meeting the needs of the not-so-spiritual. With the growth has come soul-searching - or the atheist equivalent - about what secular campus groups should look like. It’s part of a broader self-examination in the atheist movement triggered by the rise of the so-called “new atheists,’’ best-selling authors who denigrate religion and blame it for the world’s ills. Should student atheist groups go it alone or build bridges with Christian groups? Organize political protests or quiet discussion groups? Adopt the militant posture of the new atheists? Or wave and smile? As teenagers move into young adulthood, some leave God behind. But not in huge numbers. More than three-quarters of young adults taking part in the National Study of Youth and Religion profess a belief in God. But almost 7 percent fewer believe in God as young adults (ages 18 to 23) than did as teenagers, according to the study, which is tracking the same group of young people as they mature. What young adults are less likely to believe in is religion. The number of those who describe themselves as “not religious’’ nearly doubled, to 27 percent, in young adulthood. Growing hostility toward religion was found, too. About 1 in 10 young adults are “irreligious’’ - or actively against religion - after virtually none of them fit that description as teenagers. At Iowa State, most of the club’s roughly 30 members are “former’’ somethings, mostly Christians. Many stress that their lives are guided not by antireligiousness, but belief in science, logic, and reason. Severin calls himself a “spiritual atheist.’’ He doesn’t believe in God or the supernatural but thinks experiences like meditation or brushes with nature can produce biochemical reactions that feel spiritual. When the ISU club began in 1999, it was mostly a discussion group. But it soon became clear that young people who leave organized religion miss something: a sense of community. So the group added movie and board-game nights and, more recently, twice-monthly Sunday brunches to the calendar. “It’s nice to be around people who aren’t going to bash me for believing in nothing,’’ said Bricelyn Rector, a freshman from Sioux City who, like others, described community as the club’s greatest asset. Members also seek to engage their peers at Iowa State, a 28,000-student science and technology school where the student body leans conservative. There’s a “Brews and Views’’ night at a local coffee house and talks by visiting speakers common to any college campus. 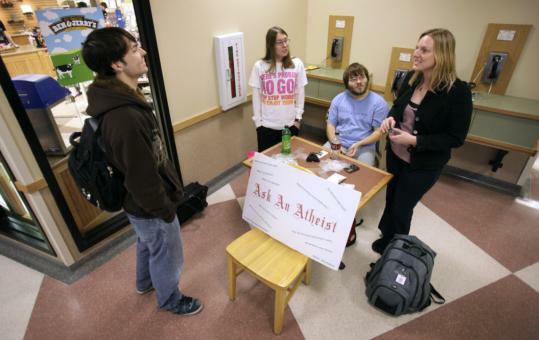 The “Ask an Atheist’’ booth is the club’s most visible outreach. On a recent Friday, a handful of members stand ready to intercept students on their way to eat lunch or withdraw money from a nearby ATM. Traffic is slow. Scott Moseley, a Bettendorf, Iowa, senior, stops for a polite conversation. He explains that he was raised Methodist, has a Buddhist friend and dates a Wiccan. “My entire concept of one religion is kind of out the window,’’ Moseley says. Bodnar, a former Catholic married to a Buddhist, recommends the local Unitarian Universalist congregation, a haven for a grab bag of religious backgrounds and a few members of the ISU Atheist and Agnostic Society.